Choose the bed that fits you best. All our rooms have been fitted out to suit your privacy needs and are accessible via electronic key card. Each dorm bed comes with its own curtains and power sockets. Enjoy your privacy in our comfy double rooms. Sleep easy on our brand new queen size mattresses! Our Twin rooms are designed with comfort and privacy in mind, relax with a friend on our brand new beds and enjoy the social environment of our hostel at your leisure. 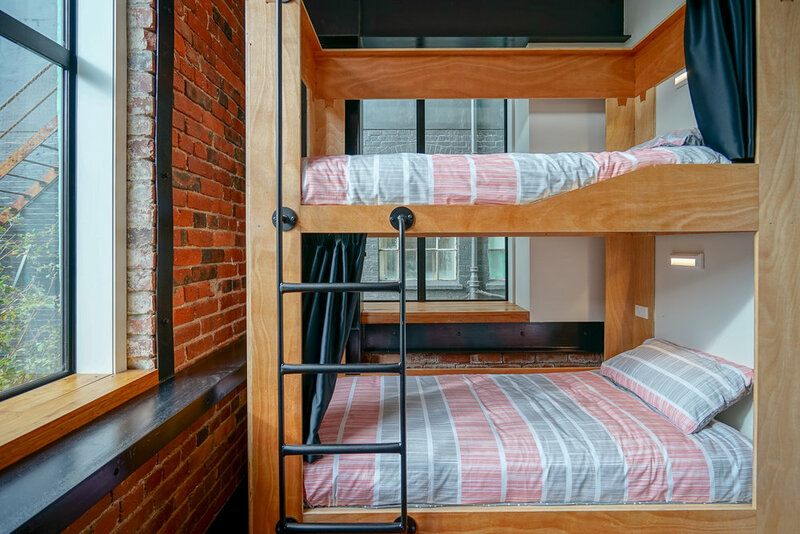 Unlike other hostel dorm rooms, our fantastic beds include - cosy custom made privacy curtains on each hand made wooden bunk. The bunks also come with handy storage draws, lighting and charging facilities.